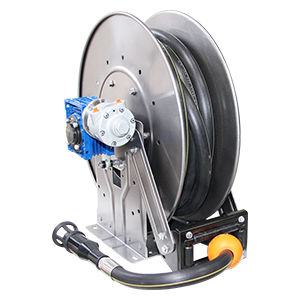 If you are looking for the longevity and reliability in your weed spraying hose storage, look no further than Reel TuffTM Remote Control Reels. Highest quality galvanised construction will continue to work alongside with you in all weather conditions. 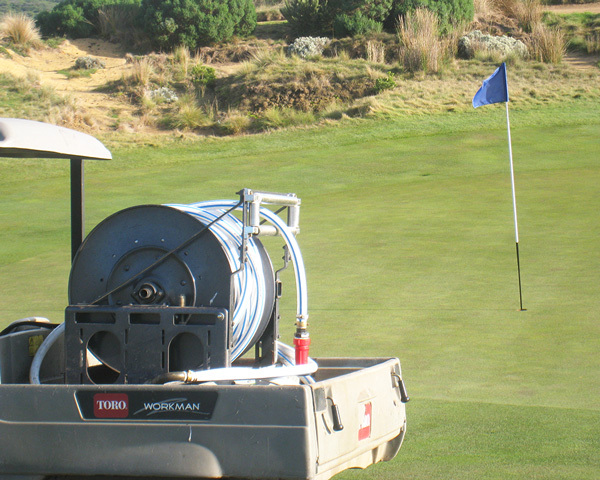 Ideal for use in both low and high pressure spraying duties in Golf Courses, Council Parks, Urban Landscapes and Roadside Care. With ergonomic and safety features like Reel-In-ControlTM Remote and Safe-R-ReelTM maintenance free Non-Belt/Chain Direct Drive System as standard, the Reel TuffTM reels are designed for both professionals and owner-operators alike. 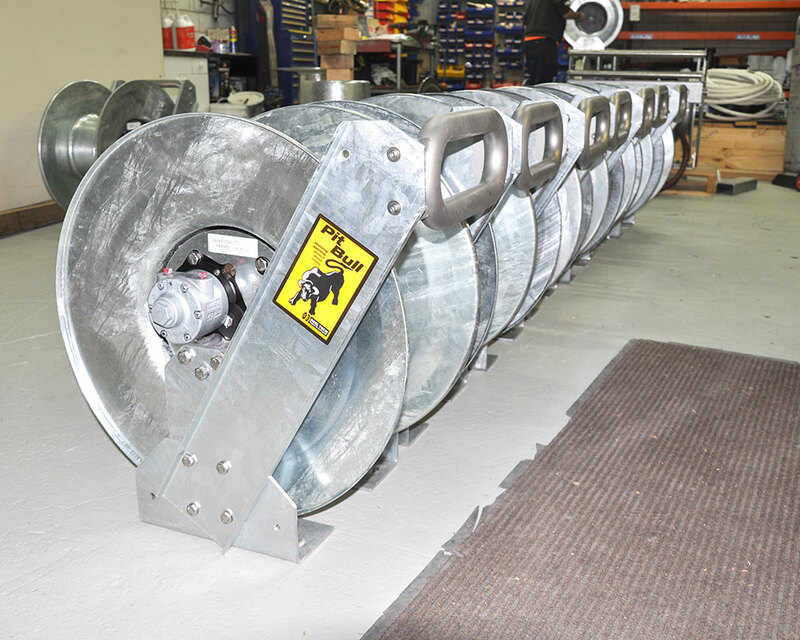 TheReel TuffTM reel is a world-patented, all Australian designed and manufactured direct drive hose reel. Featuring unmatched flexibility in size and capacity, adaptable Reel-In-ControlTM remote and a unique Non-Belt/ Chain Safe-R-ReelTM gearbox that ensures a controlled speed during rewind. 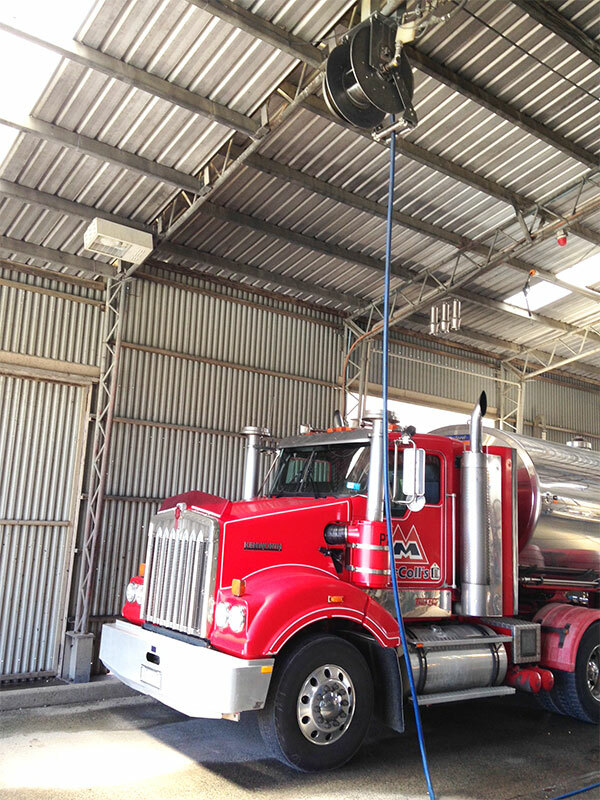 It offers superior craftsmanship and quality galvanised construction, which has been proven to withstand some of the harshest environments in Australia. 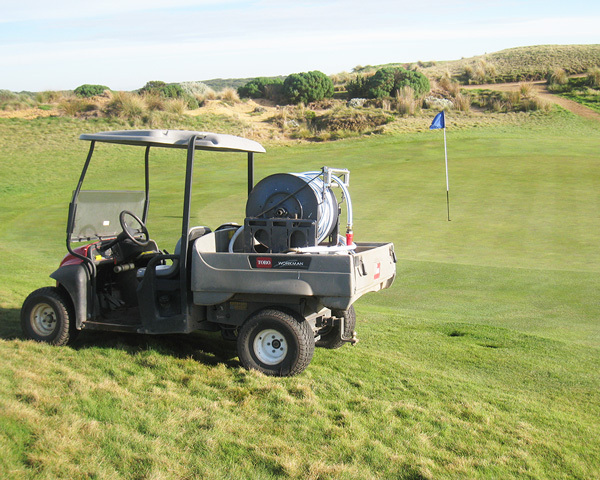 Reel TuffTM Hose Reels can be easily installed to many vehicles with 12V power supply including Utes, ATV’s, Golf Buggies, etc., and can be customised to suit your specific needs. 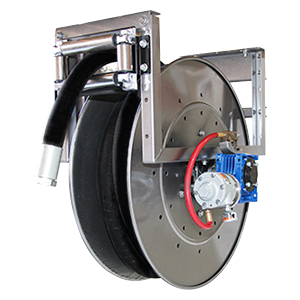 Use as a single unit or in a mirrored configuration for dual independent hose reel setup allowing multiple operators to cover large areas in half the time. Use Reel TuffTM Hose Reels with your spray equipment to enjoy the outstanding safety features, and achieve more spraying in less time and effort than conventional methods using manual reels. 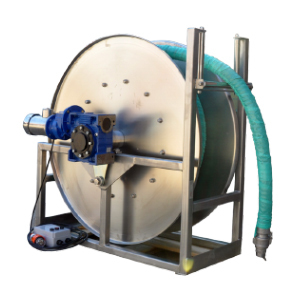 Benefit from the Reel-In-ControlTM automatic hose rewind at a single press of a button, and the motor drive capable of safely retrieving the hose even at full extension. 1/2” (12.7mm) O.D. and other width capacity are are available upon request Hose and Spray Gun sold separately. Ideal for roadside spraying and/or lawn maintenance of any size including parks, golf courses and urban landscapes. 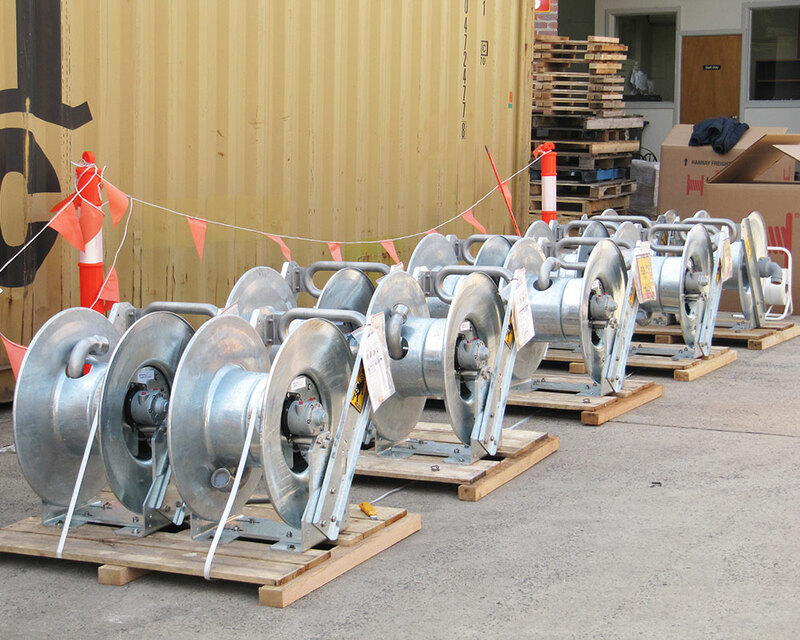 Reels can be tailored specifically for the application to suit either new or after-market installations. Available options include: Lightweight Aluminium construction Various drive options including 24V (DC) Electric, Air or Hydraulics Auxiliary Manual Crank Rewind EZI-DEPLOY™ – Auto De-clutching System FlatWinderTM – Automatic Hose Layering System Various Brake Systems and much more. Customisable decals available upon request Decals can be colour coded or designed to your specifications. Hot Dip Galvanised Discs & Frame as standard feature. Offers superior corrosion and weather protection with ultimate scratch resistance over painted or powder coated reels. 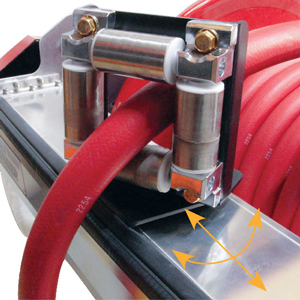 Comes standard to eliminate accidental unspooling of hose. Positive locking of spool safely keeps hose & spray gun tightly on the reel when not in use and/or during transit. Wireless Long Range Remote Control comes standard.915 MHz for AU921 MHz for NZ Featuring frequency hopping technology which offers powerful and reliable connection. Provides interference or jamming immunity in various undulating terrains. Allows for up to 8 transmitters to be used in the same area. Reel Tech’s patented ‘Non-Belt/Chain’ Safe-R-Reel™ gearbox as standard feature. Ensures a controlled speed during rewind. 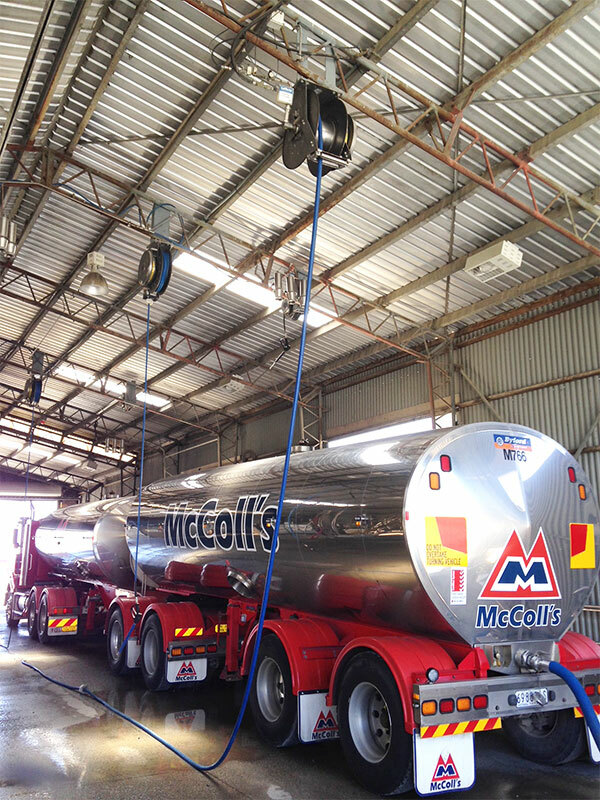 The Non-Belt/Chain design makes it most reliable and safe with no maintenance required. High Pressure Full Flow Swivel at no extra cost. Ensures minimum pressure drop across the reel. Can be used with most types of chemicals, including herbicides, fungicides, pesticides, etc. Quick Change Stainless Steel Swivel & Riser ASM offers corrosion resistant fluid path suitable for use with many aggressive chemicals. Electric Safe-R-ReelTM Non-Belt/Chain Direct Drive System offers more reliable and safer working conditions. This patented gearbox eliminates the use of chains, belts and sprockets that require regular maintenance. Heavy Duty Thick Gauge Steel Construction for stability and strength. Cantilevered Spool Hub direct coupled to self-contained gearbox offers easy spool removal and is effectively maintenance free. 12V (DC) High Torque electric motor direct coupled to patented gearbox. Remote Control: Single channel remote control (915 MHz for Australia & 921 MHz for New Zealand) with Adaptive Frequency Hopping prevents interference and offers reliable performance across undulating terrain. Rubber-sheathed for extra protection. Supplied fitted with 9V battery. 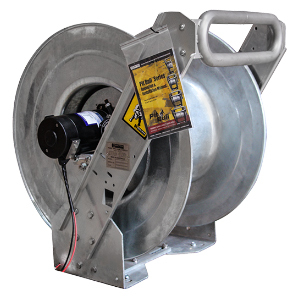 Reel Mounted Controls: On/Off power switch and manual override momentary push-button for hose retraction. Brake System: Spring loaded Pin-Lock with ratchet mechanism keeps hose safely on the reel and prevents hose or spray gun damage in transport.